the style of the dress almost reminds me of a kimono with a simple obi to tie it with. HA! It’s loverly anyway! At least you can look down at your dress while you are wearing it and read it right side up! :)My mom (who is a very learned and wordy woman, like yourself) made me a fleece robe for Xmas a few years back out of an awesome purple Cookie Monster fabric (I was 30 at the time).When I opened it that morning she explained, “I am guessing it’s some kind of spanish fabric, because it says Muy Muy Muy all over it.” I put it on and looked in the mirror and realized she had cut the fabric wrong side out. It actually said, “Yum Yum Yum.”We both howled with laughter. I still razz her about it. How fantastic! I can’t decide wheter if I would fill in a few answers or leave it blank if it was mine.If I owned this it would be part of day to way wardrobe. Its just simply too awesome. I second the motion to fill in a few words upside down. Think what wonderful words you could use, and how to juxtapose them! If you don’t like to use a sharpie, use laser printed letterfont in an iron-on. Dress A Day, maybe? The whole URL, crossword style? This Was Cut Upside Down On Purpose? Gee, I’ll be thinking of things to write all day now. Britex Fabrics in San Francisco? I LOVE that shop! I work in San Francisco and spend a ridiculous number of lunch hours at Britex. It’s a veritable treasure trove!PS: your dress is adorable! I love this dress! I also think you should fill in some of the boxes with a great phrase.I love this pattern, too. Every time I see one of your dresses, I think “I should get that pattern.” It looks to be universally flattering and wonderfully comfortable. I LOVE it! You are obviously a “glass half full” kind of gal! ROFL!! You poor thing… I have to admit that I’m happy I’m not the only one that makes mistakes. HA!! I would totally buy your story… sure I would… really I would… HA! I was also going to suggest filling in a few of the spaces. Love it!!! See how hapy an accident can be??? It’s a beaut. I read your column in the Boston Globe this morning and found out about sewing blogs, never knew such things existed! What fun! This is the first time I have ever read any blogs which probably gives a hint as to my age–72 but still making my own clothes and things for granddaughters too. 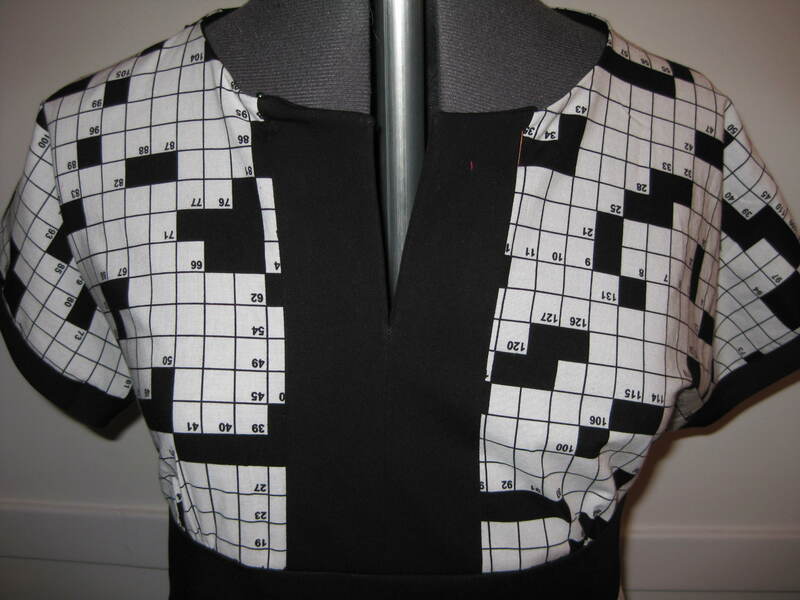 Always do the morning crossword and think your dress is great. I didn’t notice that it was upside down when I met you (it was nice to meet you, BTW), and I did think it was a really cute dress! Spoonflower is great! I just got some samples of the design I made and I am very happy with it. 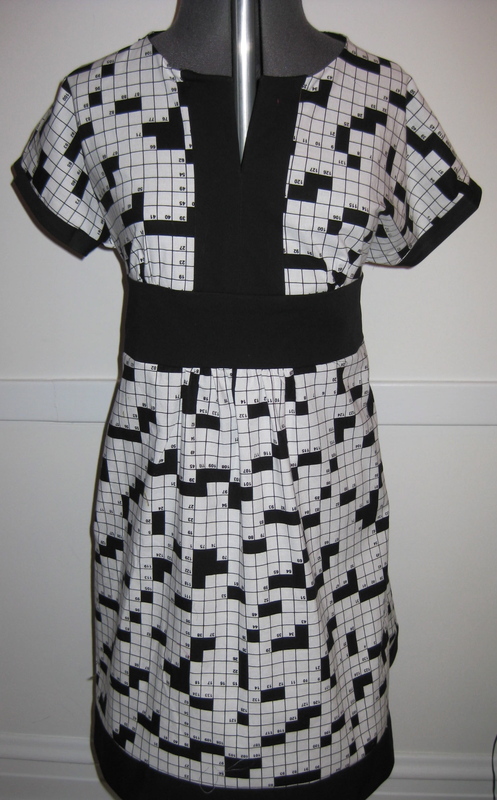 So I am sure your morning crossword dress will be great! I have never made clothes for myself with the exception of a few crazy simply summer skirts. I sew a good portion of my 2 year old’s wardrobe though. But Friday, I ordered this pattern. I am going to do it. I know I have the skills, it just seems so BIG to sew myself a dress. I am pretty excited about it, although I am feeling much anxiety about having to choose fabric. So cute! My mom once made me a lovely long sleeve blue dress with little puppies on it. All were upside down and it looked like a dead dog dress :(. She was reallly upset with herself, I didn’t care. please tell me where do you buy the material (fabric)? This fabric is out of print, but it sometimes turns up on Ebay and Etsy! Good luck tracking some down!